Astronaut Richard Arnold, STS-119 mission specialist, participates in the mission's first scheduled session of extravehicular activity (EVA) as construction and maintenance continue on the ISS on March 19, 2009. Thesmell of space will linger for the seven astronauts aboard the space shuttleDiscovery long after they return to Earth on Saturday. "Onething I've heard people say before, but it wasn't so obvious, was the smellright when you open up that hatch," Discovery pilot Dominic"Tony" Antonelli said after a March 21 spacewalk. "Spacedefinitely has a smell that's different than anything else." Theodor, Antonelli said, could be smelled once spacewalkers locked the stationairlock's outer hatch and reopened the inner door. Discoveryis set to land at 1:39 p.m. EDT (1739 GMT) tomorrow at NASA's Kennedy SpaceCenter in Florida after a13-day mission that delivered a new crewmember and the final set of U.S.solar wings to the International Space Station. It was after each of thethree spacewalks performed by the shuttle crew that the spaceflyersdetected the distinctive odor of space. Japaneseastronaut Koichi Wakata, who launched to the station aboard Discovery andstayed behind when it left to join the outpost's crew, said he also could smellthe odd odor that wafted in from outside the station. But both Antonelli andWakata, who helped Discovery's spacewalkers climb in and out of theirspacesuits, could not put words to the distinctive out-of-this-world scent. 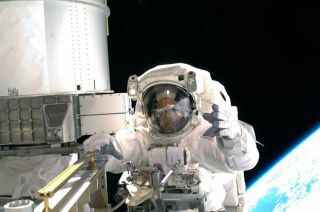 FormerNASA astronaut Thomas Jones, a veteranof three spacewalks before retiring from spaceflying in 2001, thinks theodor could stem from atomic oxygen that clings to spacesuit fabric. "Whenyou repressurize the airlock and get out of your suit, there is a distinct odorof ozone, a faint acrid smell," Jones told SPACE.com, adding thatthe smell is also similar to burnt gunpowder or the ozone smell of electricalequipment. "It's not noticeable inside the suit. The suit smells likeplastic inside." Thesmell, he adds, only occurs on a shuttle or the space station after a spacewalkand is unmistakable to astronauts working with the spacesuits and equipmentthat was used in the vacuum of space. "Inthose tight spaces, your nose gets right next to the fabric," Jones said. "I like to think of it as getting a whiff of vacuum!" Thethree spacewalks performed by Discovery's crew occurred between March 19 andMonday as the astronauts installed the space station's final set of solararrays to boost the orbiting laboratory to full power. Theshuttle ferried Wakata — Japan's first long-term resident — to the spacestation, where he replaced NASAastronaut Sandra Magnus as a member of the outpost's three-person crew.Magnus is returning home aboard Discovery to complete a 4 1/2-month mission tothe space station. The shuttle undocked from the space station on Wednesday. Discoveryastronauts spent Friday checking the shuttle's systems for its planned landingtomorrow and speaking with students at Punahou Schoolin Honolulu, Hawaii, PresidentBarack Obama's high school alma mater. The spaceflyers spoke with PresidentObama before departing the space station. SPACE.comis providing continuous coverage of Discovery's STS-119 mission with reporter Clara Moskowitz and senior editor TariqMalik in New York. Clickhere for mission updates and SPACE.com's live NASA TV video feed.